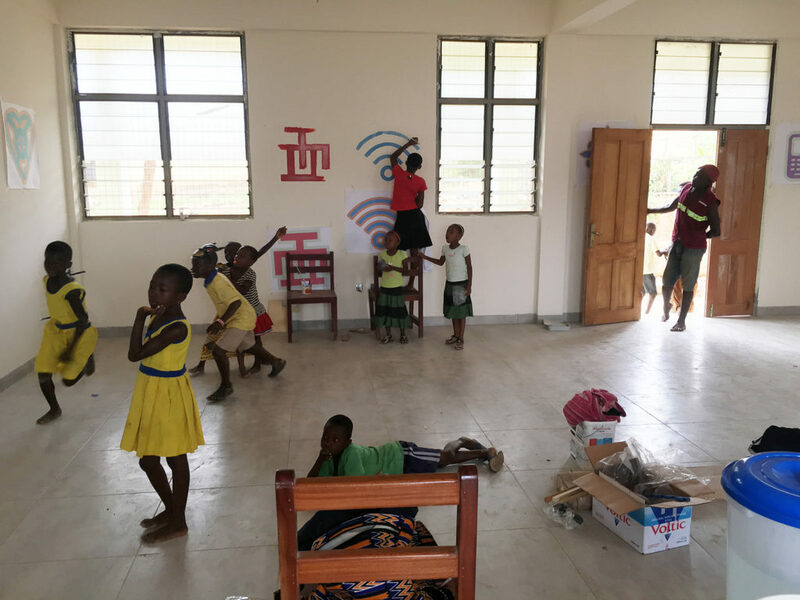 The Yale Alumni Service Corps (YASC) returned to their adopted village of Yamoransa, Ghana for their fourth trip. 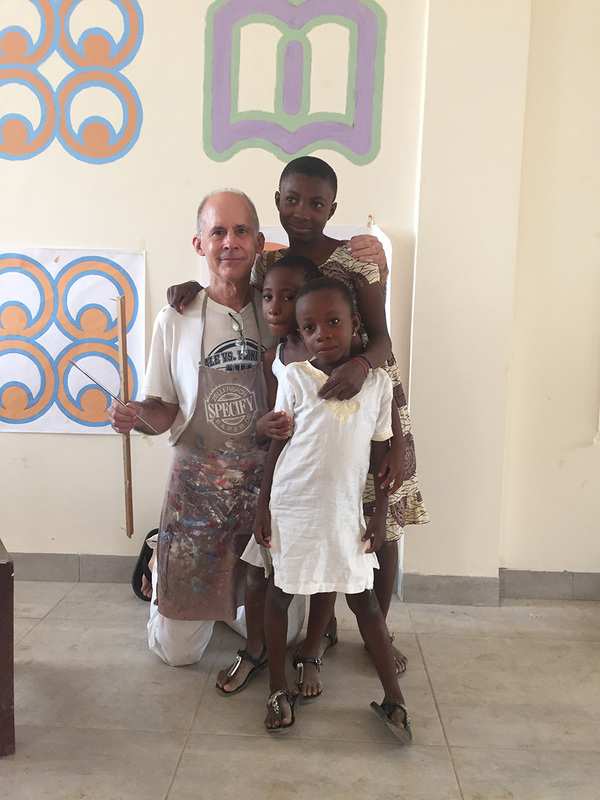 John Boak ’70 went along this time charged with a mission to paint murals in two of the rooms of the building (the Information Communications & Technology Center) that YASC has constructed over the past four years. 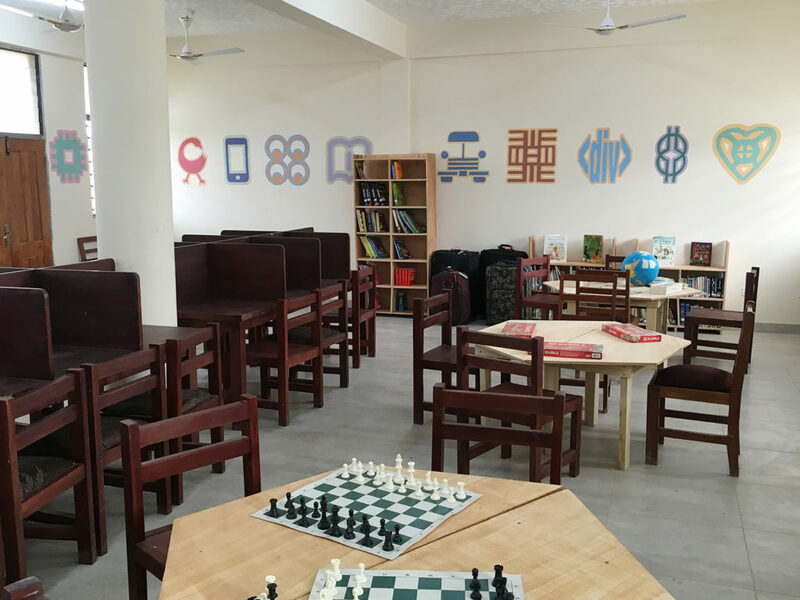 In the library he and his team of local volunteers painted a frieze of 23 symbols around the room on all four walls. 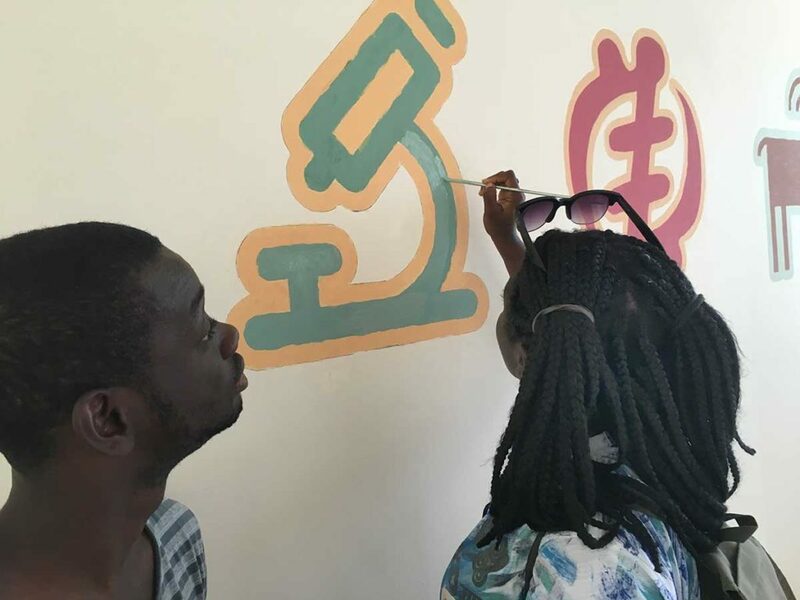 The library mural integrates traditional Adinkra symbols along with others signifying both everyday life and also the information-tech mission of the new building. 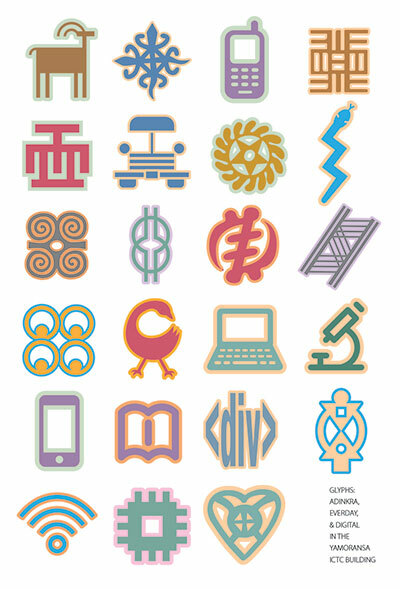 The Adinkra symbols are widely used in Ghana, referring to different elements of wisdom, collective knowledge and social fabric. 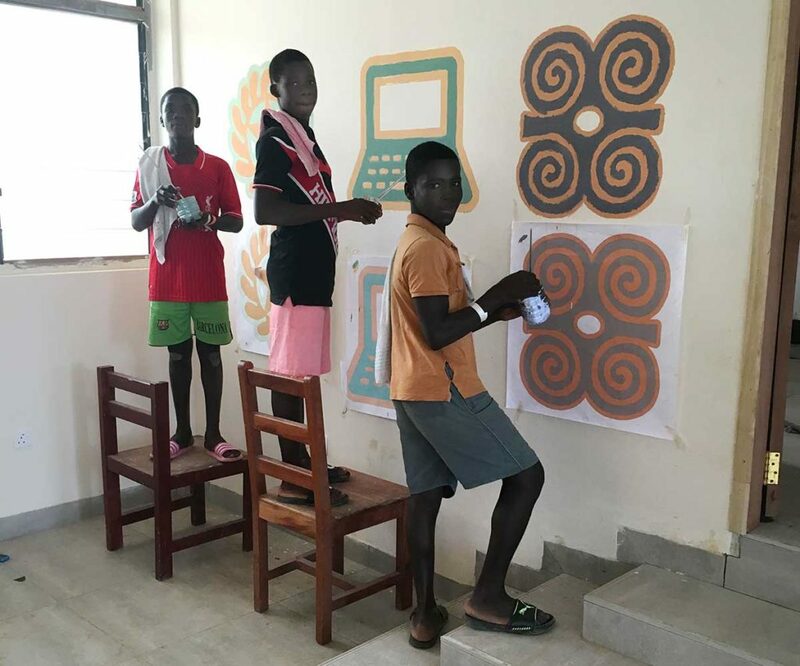 The choice of Adinkra symbols was approved locally with input and substitutions by Kofi Awusabo-Asare, a professor at Cape Coast University, who facilitated many details of the whole YASC project. The murals were designed over the summer. John arrived in Yamoransa with full-sized drawings to be traced on thewalls, plus a kit of brushes and other tools. 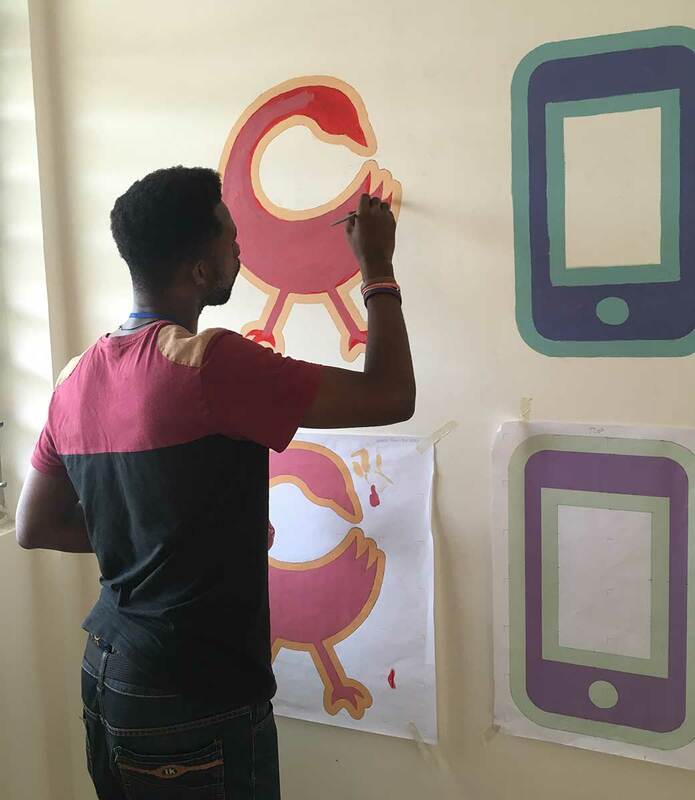 In addition to a library mural, the community made a specific request for a mural about kenkey production. Kenkey, pronounced “ken kay” is a Ghanian staple made of fermented corn meal, and Yamoransa has a reputation in its region for excellent Fante kenkey. One of the women is working on a large pot of the food. The other woman is off to market, with a head tray of kenkey blocks wrapped in leaves. The two murals were painted in 5 workdays. 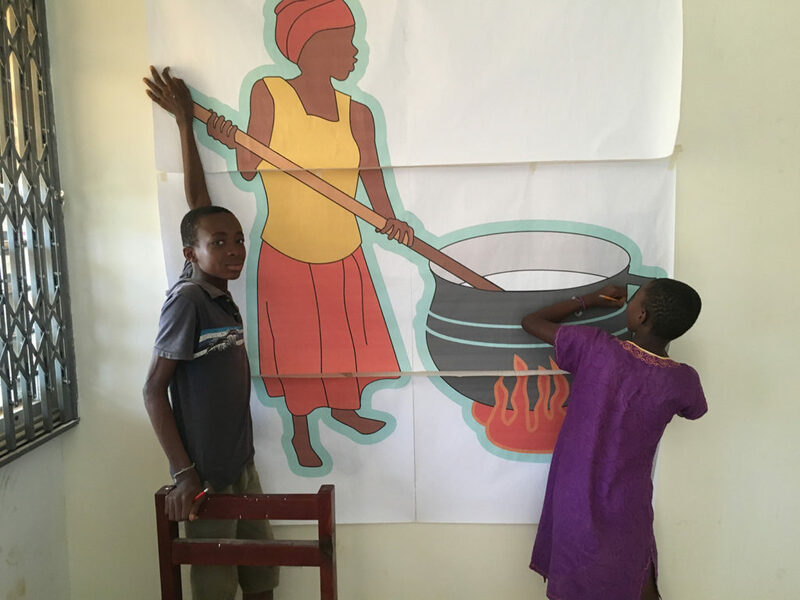 The application of drawings and then the painting itself was done in large part by three excellent AFS (American Field Service is allied to YASC) volunteers (James Brown, Kobina Otchere, and Jesse Nkansah) and a number of walk-in volunteers, mostly children of Yamoransa. 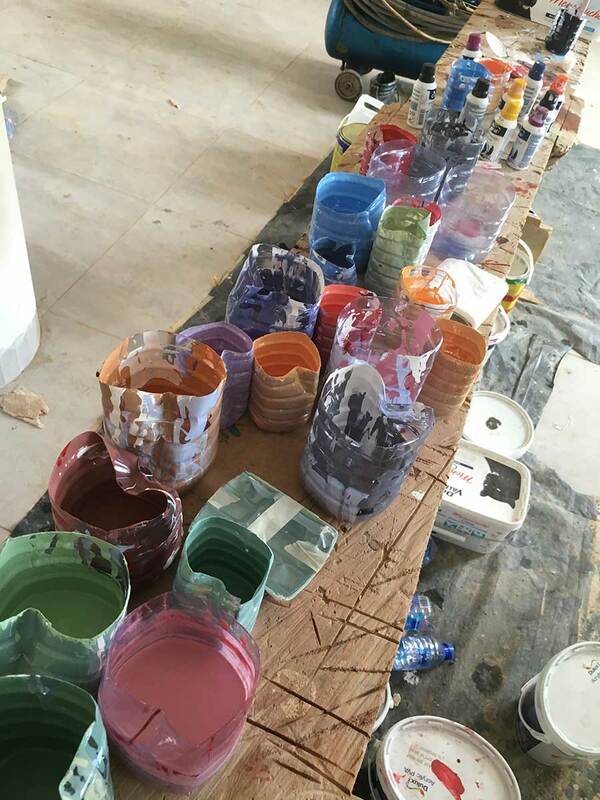 “I was on the job mixing paint, guiding my volunteers, managing them and the project,” says Boak. “I still did a variety of painting, from whole glyphs to second or even third coats as I tuned the color. I refined a lot of edges, too. I did leave some rough work, like on the two-rams glyph, because it had a consistent style of rough brush work and looked good. 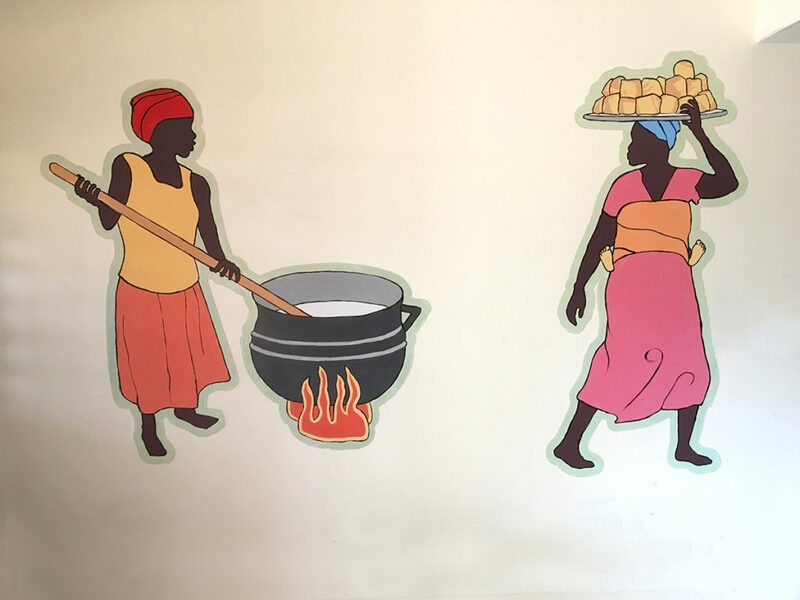 “I painted the black outline on the kenkey ladies. But almost all the color on both of those figures was painted by my two top child volunteers, Clementina and Collins. In between, I was working on keeping order in the room. 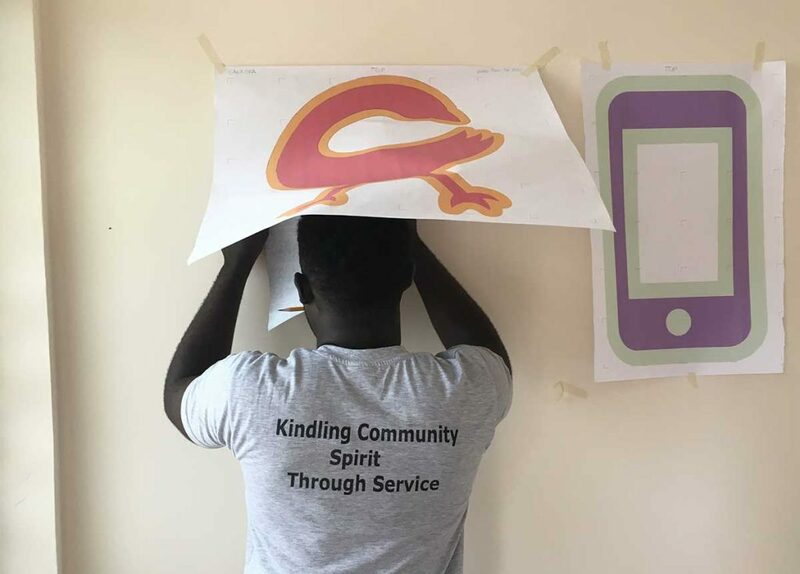 There were more kids volunteering than we had available work.” He reports that the trip was exhausting, but was pleased that it involved so much of the community. To see Boak’s YASC Yamoransa ’16 photos, click here. Volunteer painters on the east wall of the Library. The glyph is Dwennimmen, Rams’ Horns, humility and strength.